This new section of path completed an integral link in Rolling Meadows’ bike path network. A new section of path in the City of Rolling Meadows has filled a vital gap in the city’s extensive bike trail system. The gap, between Kirchoff Road and the Rolling Meadows Public Library, fell in the heart of Rolling Meadows’ downtown. The only section of land available to complete this link was a narrow area overgrown with scrub trees and a severe slope running down towards Salt Creek. To avoid potential floodway and wetland impacts, CBBEL designed a 1,000-ft. bike path to stay out of the Salt Creek floodway and floodplain, which saved time, money and did not compromise any floodplain storage along Salt Creek. The cooperation of the adjacent condominium complex providing an easement was vital to this project. In order to build the path on the steep side slope, large block retaining walls were used on both sides of the slope. 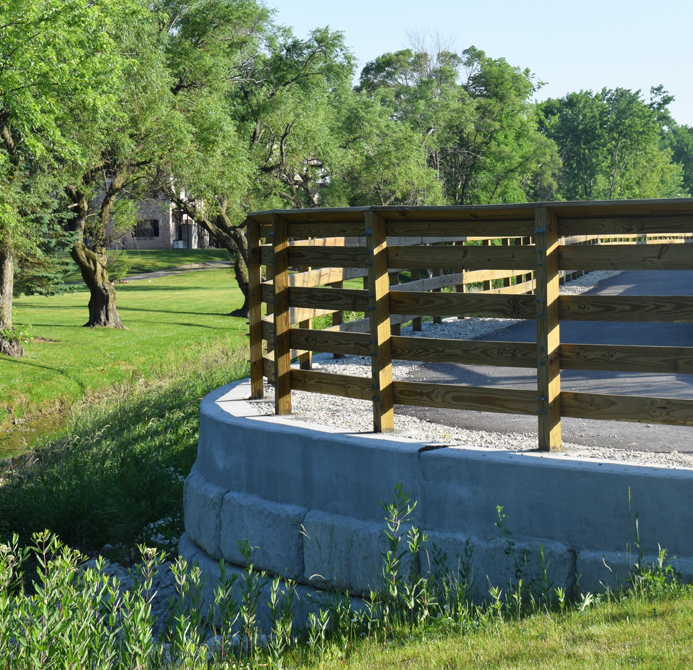 Bike-friendly pedestrian railing was installed along Salt Creek and the area was heavily landscaped, leaving an aesthetically pleasing area for the heavily traveled bike path section in the heart of downtown Rolling Meadows. CBBEL assisted the City in securing funding and performed Phase I, II and III engineering services.